Peonies are perennial plants that are hardy in USDA plant hardiness zones 4 to 9. They have large flowers, which bloom in the spring or early summer and let off a sweet fragrance. Peonies do not have to be divided and transplanted as often as other perennial plants. However, do so when you notice they are not flowering as much as they did in previous years, as this is a sign of overcrowding. Divide also simply for propagation. 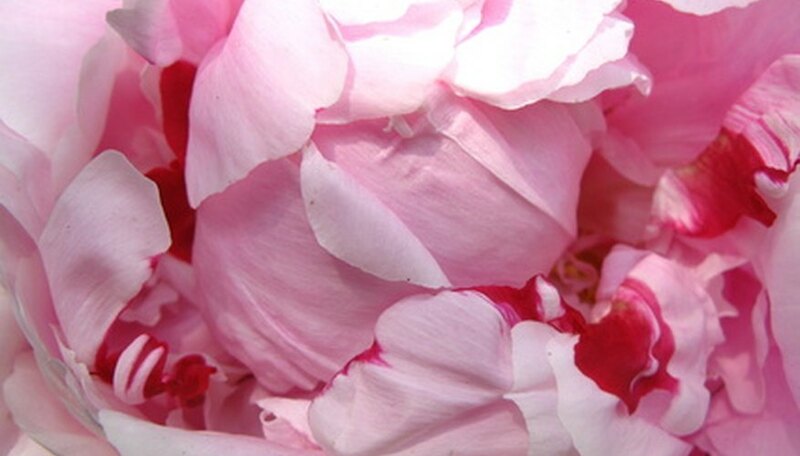 Cut and separate your peony roots in late summer or early fall, depending on your climate. Cut the leaves back after they turn yellow with clippers or pruning shears so that 4 inches of the plants remain above ground. Dig up your peonies. Dig about 4 to 6 inches deep about 2 to 3 inches from the crown. Adjust as you feel or see roots. Cut in toward the center and gently pull down on the handle of your trowel or garden fork to lift the plant out of the soil, keeping the roots intact. Shake off as much of the soil as possible and wash the roots with your hose. Now you can clearly see the roots for proper division. Lay the plants down on their side and examine the roots. Use a clean, sharp knife, such as a utility knife, to cut off any damaged or diseased-looking roots. Then, cut divisions so each section has three to five eyes (buds), which are pink. Replant the divisions immediately in a sunny location. Each clump should be planted 1 inch deep in USDA plant hardiness zones 8 and 9, and 2 inches deep in zones 4 to 7. Space multiple clumps 2 to 3 feet from one another. Water the site with about 2 inches of water. Your peonies will grow and bloom again in the spring.